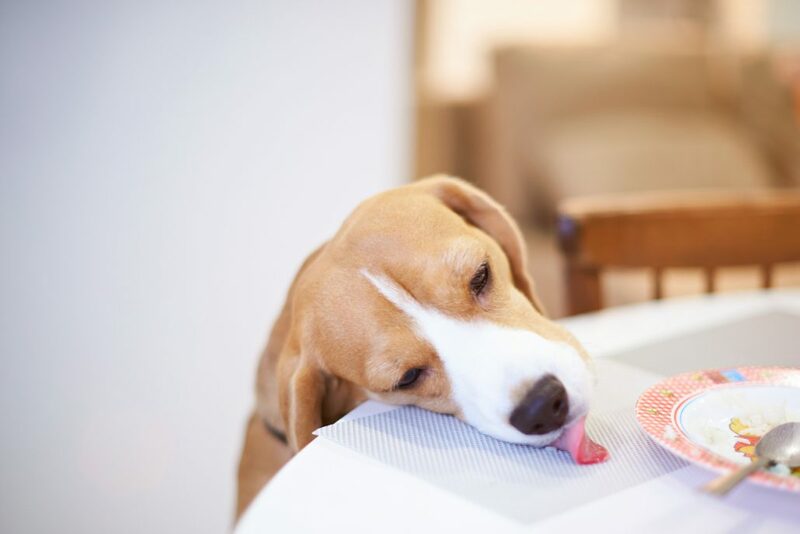 Prevent your dog from stealing food (a.k.a. counter surfing) by keeping it out of reach and teach him to “leave it”. Place a small piece of food (“teaser”) on the counter with your hand covering it. C/T ( click and treat) or praise and reward with a different treat for ignoring the teaser. Ignore any attempts to get the teaser. Do not say “leave it”, just be patient . Practice this until your dog is leaving the “teaser” immediately after you put it on the counter and cover it with your hand. Place the “teaser” on the counter uncovered – but be poised to cover it if your dog should decide to grab it. C/T (always with a different treat than the one on the counter) for calm behavior and ignoring the food on the counter. Practice this until your dog is great at it. Slowly add distance between yourself and the teaser on the counter. Now begin to increase the amount of time your dog must wait before you C/T him for leaving the teaser. Stay close while you practice first practice this. Do short practices with you nearby practicing with different teaser food items on the counter and in different areas of the counter. Try adding a couple of these factors together (i.e distance and duration). Make sure you practice turning your back and if you want to you can work on having him leave the food while you go out of sight. Begin by making it very quick and returning to jackpot him (give extra treats). If he should accidentally get the food at some point, it’s no big deal, but do your best to go at the right pace so that he is successful. Don’t forget to reward your dog once you are using this behavior in “real life” or he will soon realize that it is more beneficial to steal then wait for his paycheck.